I feel like it’s a good time to revisit the lovely world of marketing, and what better way is there than sticking with the schizophrenic topic of food branding? Sometimes we see different marketing campaigns for the same product; other times we see the same marketing campaign for different formulations of a product. One thing is for sure – the game is about getting and keeping your attention. The kicker is, ‘getting’ and ‘keeping’ are two separate problems with many opposing solutions, sometimes with hilarious results. Brand names are powerful. They stand for something. They keep you coming back because you enjoy and trust the brand. But they can get stale. Brands often undergo makeovers to keep things fresh, but sometimes companies want to sell something that is actually new but attach an old brand to it for instant recognition. This is where sub-branding comes in. Let’s look at a simple example. 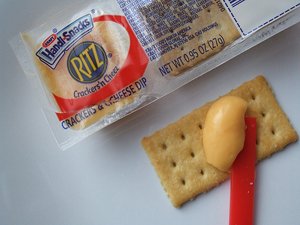 When I mention Handi-Snacks, everyone will immediately think of one thing. Let’s ignore the cross-branding of including the word Ritz here. 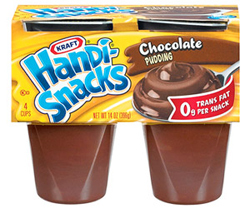 What you have is simple: the Kraft brand and the Handi-Snacks product. (Quick Aside: Note the labels of ‘Cheez’ and ‘Cheese Dip’, but never ‘Cheese’. That’s all legal maneuvering.) This is how it was in the beginning, but Handi-Snacks got too big for their own head and had to spill over into a new line. That’s right. 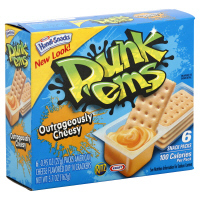 Now your favorite cheez snack is called Kraft Handi-Snacks Dunk ‘ems, a horrible perversion of punctuation and plurals. Why the need to distinguish exactly what type of Handi-Snack this was? That’s right. For the pudding line. Which interestingly enough, doesn’t have a sub-brand of its own. 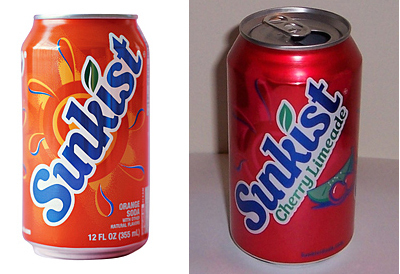 One would think they would leave the old product alone and just give the sub-brand to the new one, but maybe that’s just Monday morning marketing. Hey, at least it was for a good cause. Ok, let’s change brands then. How about Tropicana? First thing that pops into your head? Anyway, back to the point at hand. Tropicana is juice. How can that be leveraged into a cool new drink? Yes! 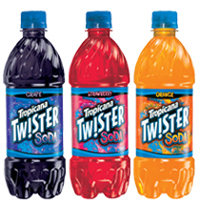 Two or three juices mixed together in a twisted flavor? I’m feeling that. I like it so far. Is that all you got? What the- Grape? Strawberry? Orange? Am I missing something here? Could they not just make Tropicana Soda? 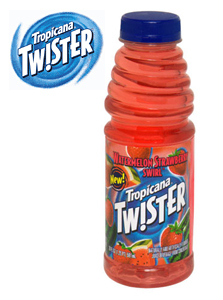 Were they worried they might weaken the brand any more than Tropicana Twister Soda would? Or is this just a case of sub-branding gone out of control? Last one up is a famous orange soda. 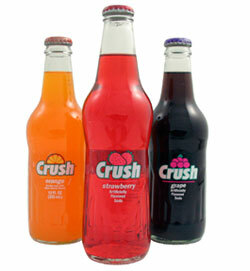 The Crush line expanded into flavors other than orange, and they handled the change fairly well. 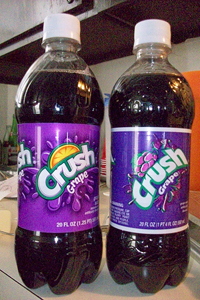 Anyway, at some point someone must have come along and thought the multiple logos were hurting the Crush brand. And after several power meetings this is apparently what they came up with (new next to old). WTF? An orange slice on my grape soda? This actually caught me off guard and forced me to do an ingredient check to make sure I knew what I was drinking! By the way, while I have your attention, let me show you someone who’s done it right. Nice little leaf gets the point across. You can have designer pictures underneath without getting in the way of the logo. Looks like a win to me. Anyway, try the Cherry Limeade. It’s my favorite new soda of the year. It tastes like candy.